Picking up sausages, more or less randomly placed on a conveyor belt, and while the belt is in movement most of the time, is not the easiest of tasks for a robot (or, two actually) to do. When this needs to be done very quickly, the task gets even more difficult. A HALCON-based vision solution which can identify the exact position of each sausage and qualify each with respect to position reference, within less than a quarter of a second is used to provide the robots with “eyes”. The solution also employs a laser-line emitting device in order to detect a 3-dimensional gripping position. ConTechPro’s ctpFalcon system was customized for this task. The image analysis is based on images from Allied Vision camera and was programmed in MVTec‘s HALCON. The communication with the robots goes through network connections. 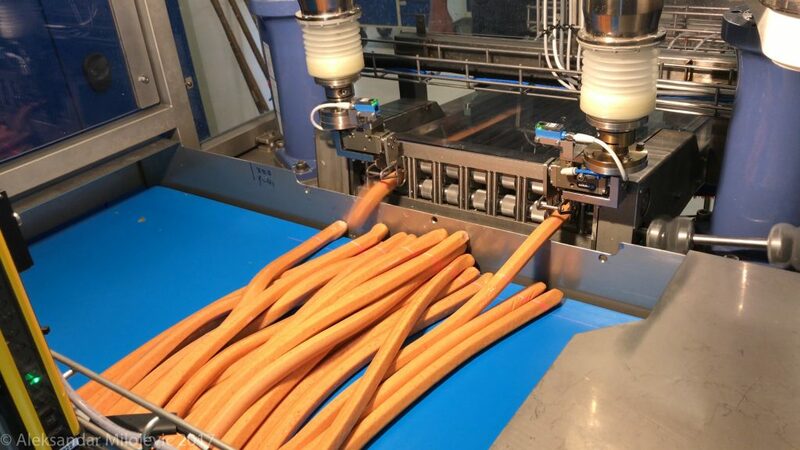 As a result of the vision analysis, each robot will receive coordinates of the best-qualified sausages, allowing it to pick one, directly. The solution was built, for a customer in Denmark, in co-operation with Letech Machines, Slagelse.